Lincolnshire Cerebral Palsy Society is delighted to welcome local professional golfer Ashton Turner to be their patron. The Lincolnshire Cerebral Palsy Society is delighted to welcome local professional golfer Ashton Turner to be their patron, as preparations continue for the charity relaunch event tomorrow evening (Friday) to raise money for Leonie Hadley-Wilkinson. Ashton Turner, 22, has recently made headlines by competing in the 147th Open - a fantastic achievement for such a young player made all the more remarkable by his Ataxic Cerebral Palsy diagnosis. Ashton refines his game locally as an honorary member of Kenwick Park Golf Club in Louth. Ashton was introduced to golf by his parents at a very young age as a form of sport therapy – it helped him to combat ataxia, a type of cerebral palsy that affects muscle control, movement and balance. 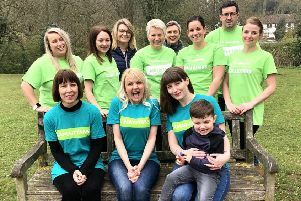 His decision to accept the position as Patron for the Lincolnshire Cerebral Palsy Society has been described as ‘a perfect fit’ by both parties. Trustees of the Lincolnshire Cerebral Palsy Society are thrilled to be announcing the appointment of their new patron the week before their first fundraising event which marks the re-launch of the charity tomorrow evening (September 21). The ‘Leonie Rumble Ball’ will be hosted by supporters of the charity Bridge McFarland Solicitors at The Beachcomber, Cleethorpes, and will feature live music from The Rumble Band. All proceeds from the event will go towards fundraising for six-year-old Louth girl Leonie Hadley-Wilkinson who has spastic quadriplegia, a severe form of cerebral palsy, to have specialist surgery to improve her condition. Leonie’s family have set their fundraising target at £35,000 to pay for the surgery and associated aftercare, and the charity is hopeful that the ball will bring them closer to their target. Speaking on behalf of the charity, Trustee Sue Lawson said: “It is a very exciting time for us as a charity. Now we have expanded our reach to the whole county of Lincolnshire we can look forward to helping even more people affected by cerebral palsy. Tickets to the charity ball are £30 per person, to include a two course meal, live entertainment from The Rumble Band, disco, raffle, and a silent auction. Tickets are on sale online at www.lincolnshirecerebralpalsy.org.uk or call the box office at the Beachcomber on 01472 812 666. The event will be open for general admission after the meal for £10 per person, payable on the door from 9pm.